There’s definitely no shortage of restaurants in Bogota. Whether you’re looking to discover little-known cafes off the tourist map but loved by the locals, or quirky establishments that could easily rival the culinary powerhouses of other big cities around the world, the Colombian capital can certainly satisfy all different tastes and appetites. I’m definitely no expert on Bogota restaurants, you can visit both Flavors of Bogota and Bogota Foodie for some top-notch food advice, but I have compiled a list of restaurants that I have visited in Bogota over the years. And I’ve included everything from the gourmet to the food coma-worthy. Take a look and let me know if there are any other Bogota restaurants that you’d add to the list (of course there are!). You really can’t go to Bogota without visiting Andres D.C or Andres Carne de Res at least once. They’re not just restaurants, they are destinations in and of themselves. Andres D.C. is in Zona Rosa, while Andres Carne de Res is in Chia, which is a suburb outside of Bogota. Both are definitely worth the visit. Take a big group of friends, put on your dancing shoes and be prepared to feast of some Colombian food, followed by a night of dancing salsa and merengue. The Andres D.C. restaurant is five levels of entertainment. Once you step in, you’ll think you’ve walk into a mini carnaval. There’s confetti, parades, cocktails, crowns and sashes that will surely make you feel like you could be part of the Miss Colombia contest. My New York-obsessed Australian friend once said: “It is the best club I have ever been to.” Now, that’s saying something! Pesquera Jaramillo isn’t the type of place you’d head along to to be wined and dined. It is just a small seafood joint with restaurants around the city including in el Centro and I heard it’s quite the icon in Bogota. They’ve been producing some of the countries best seafood dishes for over 30 years and have larger and more expensive restaurants around the city. This particular restaurant has all different types of seafood, but the main reason this place is so popular is because of their fish burgers. They’re simple too, either a burger bun or a couple of arepas with a fish-like patty slapped between them. No sauce, no salad, just that. Simple. If you know me at all, then you’ll know my love of hot chocolate with cheese (you thought I was going to say arepas, didn’t you?) I have definitely had my fair share of hot choccos in Bogota, too. But there are a couple of places that absolutely nail the onces and La Pasteleria la Florida is one of them. First up, here’s a little bit of history about the place. Way back in 1934 a Spanish chap came to this fine area of Colombia and opened up his very well-known establishment two years later and La Florida has been baking bread and producing delicious desserts ever since. For cooking buffs and food lovers, the bakery is on display, with a window for patrons to peek through while eating at the Panadería. 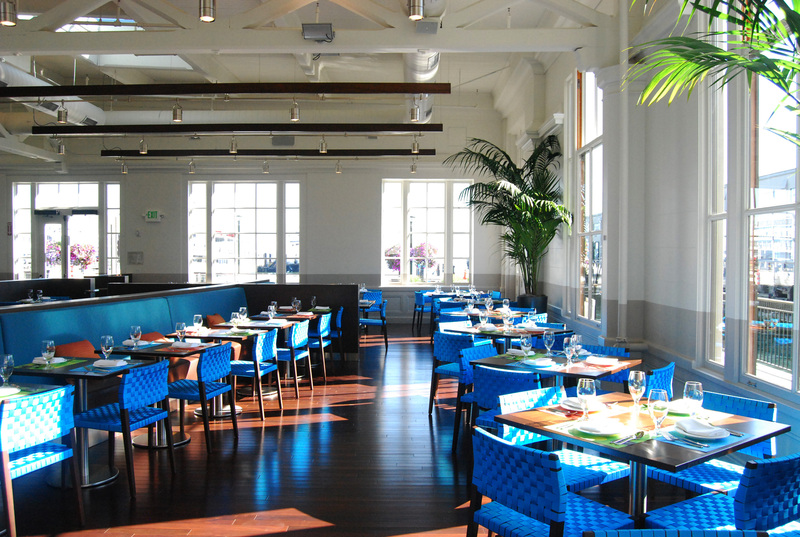 The place is spread across two levels, with elegantly-dressed waiters and well-presented tables. Sit down and order yourself a Tamal Tolimnese with hot choco, it includes tamal, hot chocolate, cheese, three types of bread, butter and jam. Then get someone to roll you home. Chamberí is a restaurant in Virrey which is headed by chef Daniel Meroño from El Cocinero Viajero. They have a variety of Spanish dishes on the menu, including things like “Homage Au Pied de Cochon” which is a share plate of different types of pork including croquettes and shredded pork portions. The idea is to share the dish which is accompanied by lettuce pockets. I am drooling just remembering this dish. The weather in Bogotá doesn’t really allow for regular flip-flop wearing (but I insist anyway) and sushi, well that is a treat! But if you too love your sushi then be sure to head along to Wok in Chapinero. I went along with a fellow Australian mate of mine and pretty much just feasted on sushi until we were asked to leave (that’s not entirely true). We had salmon sashimi, trout rolls, green curry and two raw smoothies. Yum. Apparently Wok was created by a Colombian woman who lived somewhere in South East Asia for a good while. Then, when she returned to Colombia, she decided to bring the Asian flavours back with her. Very glad she did too! Wok doesn’t just do sushi either, they specialise in flavours from Vietnam, Cambodia, Thailand, Indonesia and Malasia. A tasty treat while you’re travelling through Bogota. The closest Bogota gets to the ocean are the regular downpours it receives throughout the year. So, when I was invited to head along to a Peruvian Cebicheria called La Mar in Usaquén, I was wondering about the quality of the seafood. But after a quick Google about this Bogotá restaurant, just to check out what to expect, I was met with a list of reviews from satisfied seafood lovers who’d already noshed their way through the extensive Peruvian menu. Created by Gastón Acurio, La Mar Cebicheria has been widely received across South and North America, with restaurants located in San Francisco, New York, Lima, Panama and Sao Paolo. Bogotá’s cebicheria seats up to 380 patrons and people still line up out the door to get a table. I visited on a Monday night, so while there were still many people, there wasn’t any fuss about getting a table. Grab yourself the Cebiche Mixto ($28,800COL) which comes as either an entree or a main, the Arroz con Mariscos ($32,800COL) and a Cebiche Vegetariano ($28,800COL) to share. That’s a food coma in the making, right there. With a name like The Fake Door or La Puerta Falsa, you know there´s got to be some sort of history to tell about this restaurant. And there is. This family-run business has been around since 1816 but the building itself was built more than 400 years ago. It burnt down not too long ago but luckily it was rebuilt with the same old-world charm, exposed wood beams and all. We popped our hungry selves in with our local Bogotano friend for a Chocolate Completo (cheese, hot chocolate, buttered bread and an almojabana or cheesey buscuit) and Tamal (yellow corn dough, rice, chicken, pork, vegetables, eggs and more). It’s hidden down a street in the Candelaria district but is so worth the search along the cobbled streets and dimly-lit alleys to get to. Climbing a mountain and watching the sun rise at the top if quite a feat. Depending on the type of mountain you’re climbing, it could take months of preparation, or just a lazy Sunday hike. But the feeling once the peak is reached is the same, it’s that Ah, I did it kind of feeling. Eventually, though, you make your way down and you might just make your way somewhere to refuel and chat about the epic adventure you’ve just had. It it was this experience of taking refuge and shelter and chatting with fellow trekkers after a climb that was the inspiration for Mauricio and Francisco, who created Café de la Montaña back in 1982. It is a restaurant, but upon walking in you feel like you have just come back from a climb or a trekking expedition. You’re not here just to eat, you’re here to talk about your adventures and to share stories. Perfect for the vegetarians travelling around Bogota, I introduce you to Maha Veg, one of my personal favourites. They have the most delicious smoothies I have tried in Colombia and have super food ingredients including macca and spirulina. This restaurant has been serving up healthy vegetarian and vegan food since 2008 and is definitely worth the visit. Head over for their lunch special which includes soup, a main dish, fruit dessert and juice for around $8,000. Delicious. And, as if delicious vego food wasn’t enough, they also offer yoga and meditation classes upstairs on certain days. Check it out. Specialising in middle-eastern inspired food, the menu at pita wok is full of tasty vegetarian and non-vegetarian options. I am a fan of the Mixto Vegeteriano myself, which is a plate full of salad, rice, falafel, tofu and tahini – all for $9,800. The limonada con hierbabuena is delicious too! Share your favourite Bogota restaurants with me in the comments section below. What have I missed? Heaps, I’m sure!